For quite some time now, I’ve been extremely interested in WebGL. Realtime, hardware-accelerated rendering embedded directly in a web-page? Sounds like a fantastic proposition. I’ve dabbled quite a bit in desktop OpenGL and have grown to like it, despite its numerous… quirks… so it seemed only natural to jump head-first into WebGL and have a look around! I was quite surprised by WebGL’s ease of use! Apart from browser compatibility (which is growing better by the week!) WebGL was relatively simple to set up. Initialize an HTML canvas context, and go to town! The rendering pipeline is nearly identical to OpenGL ES, and supports the majority of the same features as well! If you have any knowledge of desktop OpenGL, the Zero-To-Triangle time of WebGL should only be an hour or so! Unfortunately, WebGL must be extremely compatible if it is to be deployed to popular web-browsers. This means that it has to run on pretty much anything with a graphics processor, and can’t rely on the user having access to the latest and greatest technologies! For instance, when writing the first draft of my lighting code, I attempted to implement a deferred rendering pipeline, but quickly discovered that multi-target rendering isn’t supported in many WebGL instances, and so I had to fall back to the more traditional forward rendering pipeline, but it works nonetheless! A textured scene featuring two point lights, and an ambient light. One can just specify a class. Now, tsGL scenes can be defined directly in the HTML document. Asset tags can be inserted to tell the engine where to find certain textures, models, and shaders. Here, we initialize a shader called “my-shader”, load an OBJ file as a mesh, and construct a material referencing a texture, and a uniform “shininess” property. We can also specify our objects in the scene this way! Here, we construct a scene with an instance of the “renderer” system, a camera, and a renderable entity! I wanted tsGL to be a platform on which to experiment with new web-technologies, and rendering concepts, so I built it to be as flexible as possible. The engine is broken into a number of discreet parts which operate independently, allowing for the addition of cool new features like rigidbody physics, a scripting interface, or whatever else I want in the future! At the moment, the project is quite trivial, but I’m hoping to expand it, test it, and optimize it in the near future. At the moment, things are a little rough around the edges. Assets are loaded asynchronously, and the main context just sits and complains until they appear. Rendering and updating operate on different intervals, so the display buffer tears like tissue paper. OpenGL is forced to make FAR more context switches than necessary, and my file parsers don’t cover the full format spec, but all in all, I’m quite proud of what I’ve managed to crank out in only ten or so hours of work! If you’d like to check out tsGL for yourself, you can download it from my GitHub page! A few years back I worked on a Unity engine game for a school project, called “Distortion”. In this game, the player has a pair of scifi-magic gloves that allows him or her to bend space. I ended up writing some really neat visual effects for the game, but it never really went anywhere. This afternoon I found a question from a fellow Unity developer, asking how to make “heat ripple” effects for a jet engine, and I decided to clean up the visual effects and package them into a neat project so that others could use it too! And so, Heatwave was born. Heatwave is a post-processing effect for the Unity game engine that takes advantage of multi-camera rendering to make cool distortion effects easy! It does this by rendering a full-screen normal map in the scene using a specialized shader. This shader will render particle effects, UI elements, or overlay graphics together into a single map that is then used to calculate refractions! The main render target is blitted to a fullscreen quad, and distorted by offsetting the UV coordinates during the copy based on the refraction vector calculated using the normal map, resulting in a nice realtime psuedo-refraction! There are a few issues with this method, mainly that it doesn’t calculate “true” refractions. The effect is meant to look nice more than to make accurate calculations, so cool effects like refracting light around corners and computing caustics aren’t possible. The advantage however is that the effect operates in screen-space. The time required to render distortion is constant, and the cost of adding additional distortion sources is near zero, making it perfect for games, and situations where a large number of sources will be messing with light! I’ve made a small asset-package so other Unity developers can download the sources and use them! You can find the project on Github here! I was playing more with OpenGL, and decided that I could re-write my existing 3D back-end to be far more flexible! After looking over asset libraries for quite some time, I decided that it would be a good idea to try and incorporate a flexible, reliable framework for reading asset data. I eventually settled on Assimp. A cross-platform library for loading dozens of different 3D assets, animations, skeletons, and some texture formats! It was admittedly a bit of a pain to work through, but once compiled, it was easily incorporated. Pretty soon, I got my system loading .Md5 models (The format used in older versions of the Quake engine). After I managed to get models loading, my next goal was animation. Skeletal animation is something I had never tried before, and frankly, I was a little afraid of it. It seems like a daunting task to begin with, especially considering the seemingly infinite number of possible skeletons and numerous model formats that could be loaded. Some model formats store their joint orientations in quaternion values, so I ended up having to write a quaternion to matrix conversion system on the back end in order to allow these formats to work! Eventually though, I got simple .Md5Anim files loading, and playing (sort of). With hours of struggle, and frustration, I finally figured it was a simple problem with multiplication order of matrices. In the end, I got these models playing arbitrary animations successfully! This system supports almost any effect, shader, or camera setup imaginable, and is flexible enough to implement a number of simple effects incredibly easily. So far, it does not support more advanced lighting features, such as shadows, but they can be added in quite simply. I was disappointed when I found out that the Unity terrain engine did not work properly on mobile devices, so I experimented with a number of different custom solutions. Over time, this project began to evolve into a fractal terrain generator, using simple noise algorithms to produce a randomly generated landscape. Next, I wrote custom shaders to blend between a stony texture and a grassy texture depending on the slope of the terrain. This worked well, but lacked the depth I felt it needed. The final step was implementing the custom shell model used to represent grass. The terrain is rendered multiple times with various vertex offsets in a multi-pass shader, with time and location based fluctuations to emulate wind, and a grass height based on slope, and some user specified parameters. The system works fairly well, and allows for a simple procedural terrain that can be dropped into any scene. A simple landscape generated by the script. A close-up of the rendered grass, implemented in the base terrain shader. A view of the generated terrain from within the Unity engine. In 2009 I began experimenting with OpenGL. I found it cumbersome and unwieldy, but incredibly versatile and powerful as a rendering engine. As a result, I wrote a simple wrapper library in order to streamline the OpenGL programming process, creating a series of wrapper classes and internal formats to dramatically simplify project workflow and make the entire OpenGL rendering framework much easier to use. This unnamed library supports a number of distinct features, such as near instantaneous mesh file loading, custom texture import functions for a number of formats, support for GLSL shaders, per-pixel lighting with a large number of dynamic lights, and multi-buffered post-processing effects. Custom per-pixel lighting model, tested on a 250,000 polygon mesh. 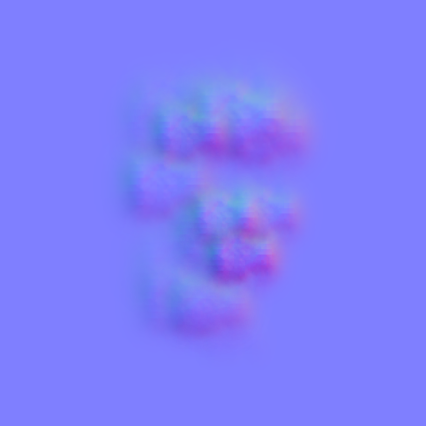 Multisample post-process effect, rendering a simple Gaussian blur in real-time. Depth of field post-processing effect with automatically calculated focal distance using depth-buffer sampling. A brief video demonstrating the library.